Sustainability is a key responsibility for prudent boards. There is growing evidence that sustainability issues present risks and opportunities and their effective management enhances company value creation and protection. Sustainability megatrends such as climate change, demographic shifts, and changing consumer preferences are creating material risks and opportunities to business, including impacts within its value chains and operating context, and thus likely to affect its future performance. As such, sustainability requires the ongoing attention of boards in their fiduciary oversight of culture, strategy, risk, resource allocation, financial performance and reporting. As sustainability has moved into the boardroom, so too has the practice of sustainability governance – which is now a board issue and a director’s responsibility. These factors have compelled leading boards to demonstrate leading practices by Embedding Sustainability into Corporate Governance. With the evolution of sustainability governance since the 2000s, there are now best practices that boards can follow to strengthen their sustainability governance and enhance long-term value creation for their companies. 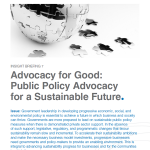 This briefing, Embedding Sustainability into Corporate Governance, provides an overview of the sustainability governance field of practice, including the perspectives of investors, financial markets, governance practitioners and non-governmental organizations (NGOs). Embedding Sustainability into Corporate Governance profiles five practice areas and 15 practices that boards and their advisors can follow to enhance their sustainability oversight roles and bring value to the company, its shareholders and society. 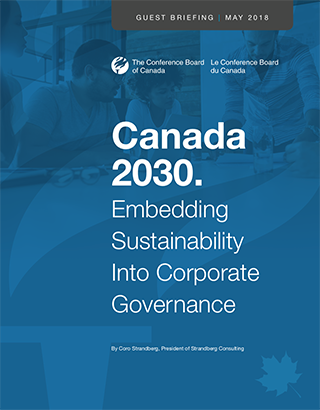 Embedding Sustainability into Corporate Governance lays out the emerging toolkit that Boards of Directors can use to adopt best practices in sustainability governance. Join the sustainability conversation. Coro is active on Twitter and LinkedIn. Coro Strandberg works with businesses, government and industry associations to envision and innovate a sustainable future. Coro is an expert on sustainability leadership and transformational business practices and relationships. She believes sustainable business changes everything for the better. A few times a year, Strandberg Consulting sends out a newsletter to keep Coro’s network up-to-date on her latest projects, publications and tools. You may subscribe to the newsletter here or visit the archives.